I have grown to become a huge fan of camouflage! There are so many ways to style it, and it can be such a chic accent to your outfit. I have worn these pants with a simple tee and tennis shoes, and I also think they would look so cute with a chambray top and mules. Today I wanted to share with y'all one way that you can dress up camo! I always tend to reach for this shirt when I'm looking for a nice, oversized top. 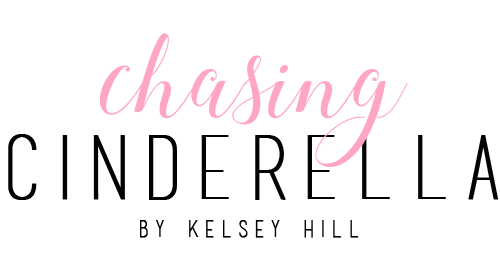 I have it in four colors and it's on sale for under $28! Love this outfit on you!!! That lipstick color is gorgeous, and I love that pop of leopard! Love that black top, so cute! I love the camo pants, leopard bag, top, and necklace - okay, wait - I love it all!!!! You look awesome! I love the black with the camo! Did you dye your hair? It looks so dark! Love! 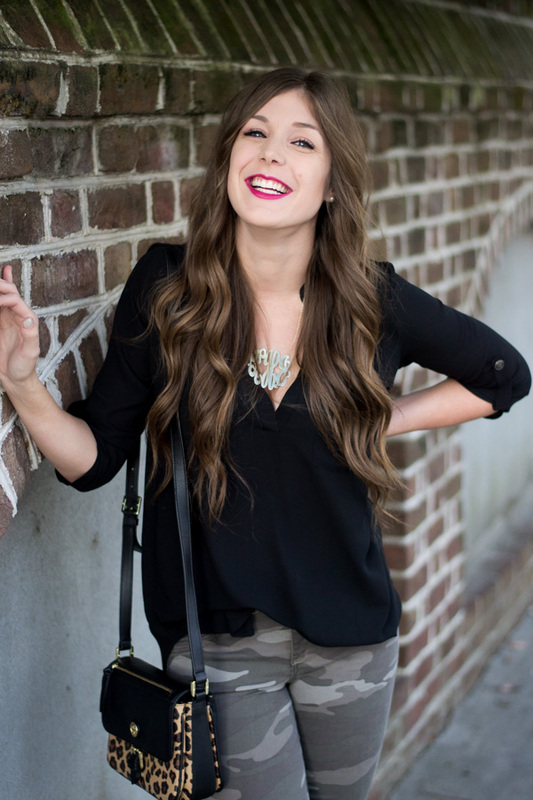 gorgeous babe <3 I love your monogram necklace & top! Where is the necklace from? You are rocking this look love, and your hair is on point! Love this look. You are adorable! I admit, I used to hate camo. But it has definitely grown on me and yours is a perfect example of camo looking classy and chic! Love the whole look and the bag paired with the pants! Loving camo as well! Paired with the leopard is super unexpected and really cute! You make camo look so stylish! I love this look! Beautiful setting and beautiful pictures! That bag is awesome! I love leopard print in winter! I've been all about dressing up camo lately too! Love how you styled these pants with heels, so chic!! 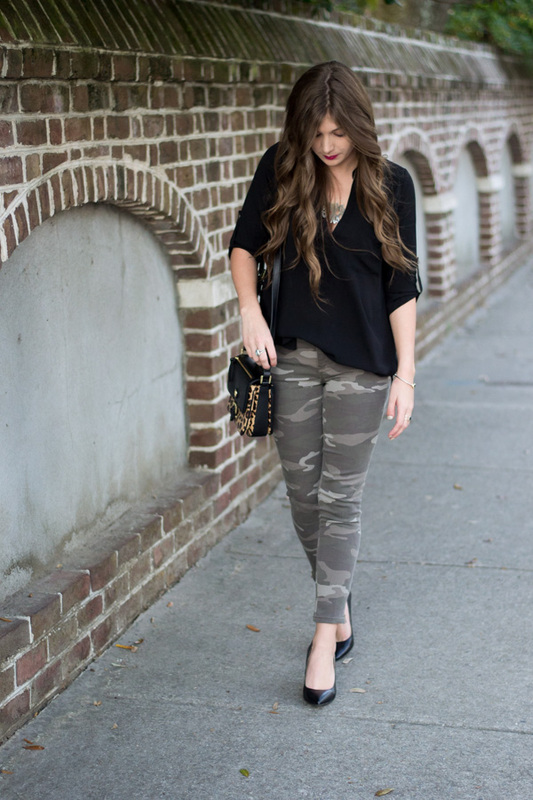 I kind of love camo pants and heels - such a great look! I love the camo trend! I haven't tried anything with it yet, haha, but I love it! This outfit is so cute! While I am diggin the camo pants, could we please talk about your amazing hair!? Wow, it's so beautiful and so long! Those camo pants are the cutest! I love how you paired them with all black! It works perfectly! Love this outfit! I always like camo on other people but I'm too afraid to buy it for myself! You look great! 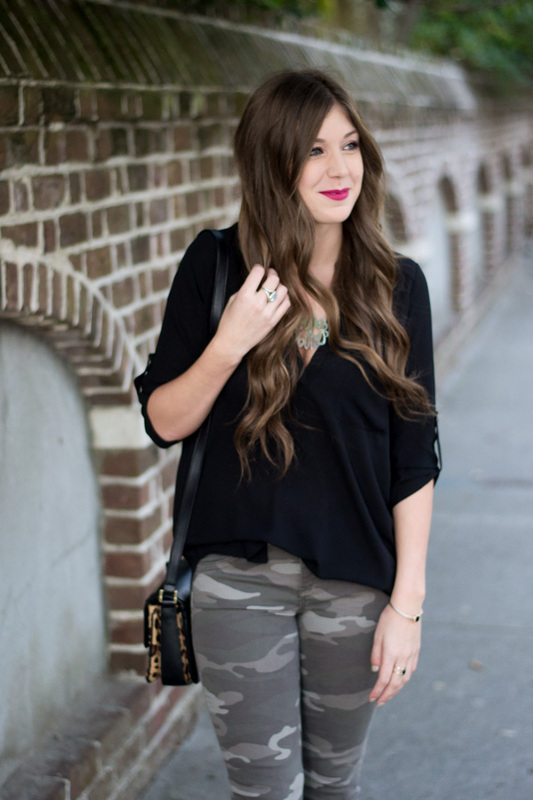 I'm not very fashionable and when I see camo, I get scared to mess up the look, so this was quite helpful! You look so good, I LOVE what you did to make this camo more dressed up. It's so chic! You look gorgeous!!! Love the camo mixed with the leopard!! you look amazing. Lovely combination! You look so pretty! Wish I could pull off camo pants like this! You look fab!! I love camo, too. It's so versatile. Love your hair! I love how you styled these pants! Yes, perfect look! I had some camo pants not long ago and took them to consign, now Im kicking myself in the head! So cute! 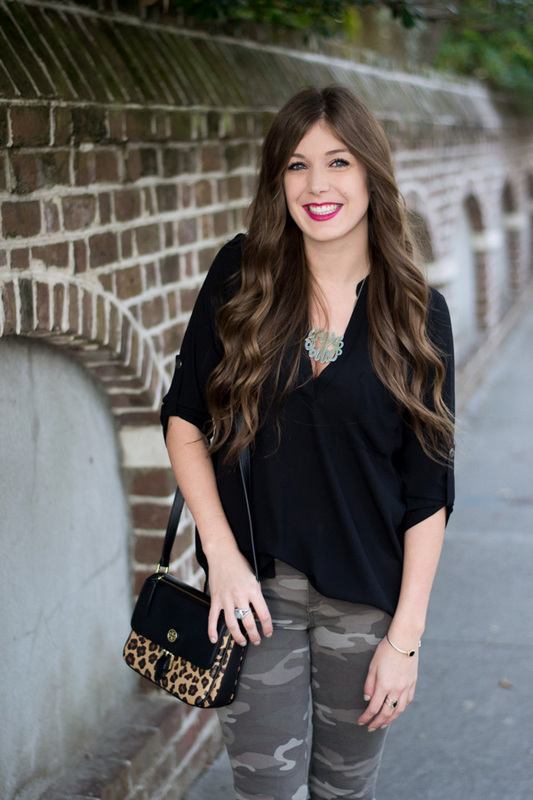 Love the camo paired with leopard!